Alternators are specifically identified by code on a car's factory build/broadcast sheet. I've found the codes used on 1969 and 1970 Mustangs to be relatively consistent as noted in the table below, but all of the 1968 build sheets I've seen for Cobra Jet Mustangs have a "38" alternator code. That would seem to indicate installation of a 38A alternator. However, it appears that Ford actually installed either a 42A (for non-Shelby CJs) or 55A (for Shelby GT500KRs with air conditioning) alternator depending on the vehicle's option package. The engineering numbers listed are documented in the Osborn electrical assembly manuals published by Jim Osborn Reproductions. Do you have a 1968 428 CJ build sheet with an alternator code other than "38"? Please consider sharing a copy if you do. Key to abbreviations: "AC" = air conditioning, "PS" = power steering. Picture courtesy of Jack Brooks. Picture courtesy of Stuart Cofer. 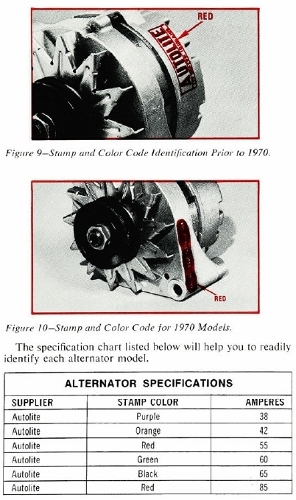 The same service alternators were later used for many different applications. For example, the same service alternator was specified for the 1970 428 CJ Mustang and the Boss 302 Mustang, but they were originally assembled using different alternators. The accessory pulley is the only significant difference I've been able to discern between the alternators listed in the table above with the same service part number. 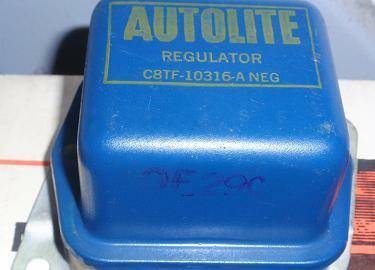 Original alternators from this time period were marked "AUTOLITE" on a teardrop-shaped area on the back of the case. Reproductions produced by AMK Products explicitly omit this detail. As described in a 2005 catalog, "Because we have found the marking difficult to see with the alternator installed we could not justify the cost of adding it. AMK units are plain." AMK has since discontinued their line of reproduction alternators. 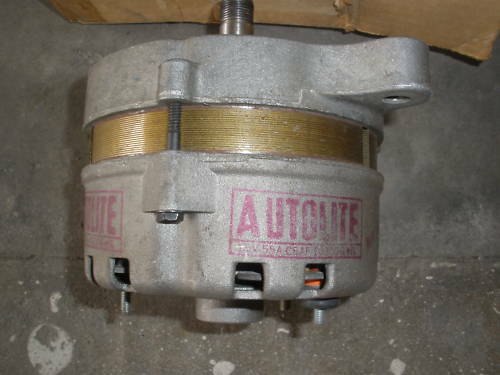 Jack Brooks of Dead Nuts On is now selling new reproduction alternators made using original Autolite housings. He intends to have molds made to cast new housings. Once the molds are ready he will still offer alternators with an original housing, but his supply will be limited. A cooling fan and pulley are mounted to the front of the alternator. During this time period both parts and the nut and lock washer used to mount them were typically plated with a yellow zinc finish. A fan with 13 evenly-spaced blades (service part number C5AZ-10A310-B, Autolite sales number GY-808) was used through November 17, 1969. After that date a fan with 10 unevenly-spaced blades (service part number D0AZ-10A310-B, Autolite sales number GP-473A) came into use. Pulleys with both one and two sheaves were used depending on options; see the pulley identification page for application information. 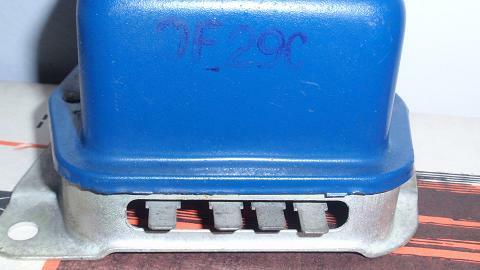 Ford used a non-integral voltage regulator for Cobra Jet Mustangs during the 1968, 1969, and 1970 model years. Mounted on the passenger-side fender apron between the battery and the shock tower, this electromechanical device automatically controls the vehicle's charging system. 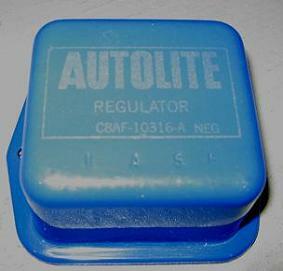 Ford's 1970 car shop manual notes that the "Autolite electromechanical regulator is factory calibrated and is not to be adjusted". Covers were riveted in place to discourage tinkering. However, earlier versions of the car shop manual include detailed adjustment procedures. If you're able and willing to remove the rivets and follow the earlier procedures it's possible to adjust both the field relay and voltage limiter functions of the regulator. Do your vehicle's lights pulse at low engine RPM? Are you using an electromechanical regulator? The mechanical relays inside the regulator might be the culprit. Voltage can fluctuate slightly as the relays open and close. Modern solid-state regulators that don't require adjustment are a drop-in replacement for the earlier electromechanical regulators, but they typically don't look concours-correct. If you want concours-correct looks and original function, AMK Products makes an excellent-looking reproduction of the original regulators. 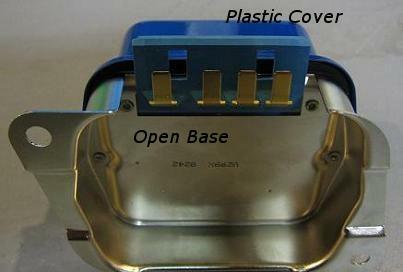 The regulators used on Cobra Jet Mustangs are identified by two different engineering numbers that appear on the cover. The cover itself is painted Ford Dark Corporate Blue. The heavy-duty regulator used on cars equipped with air conditioning is identified by yellow lettering and engineering number C8TF-10316-A. The standard regulator used on all other cars is identified by silver lettering and engineering number C8AF-10316-A. The C8AF-A regulator is often described as being used on cars equipped with 38A and 42A alternators while the C8TF-A regulator is often described as being used with 55A alternators. 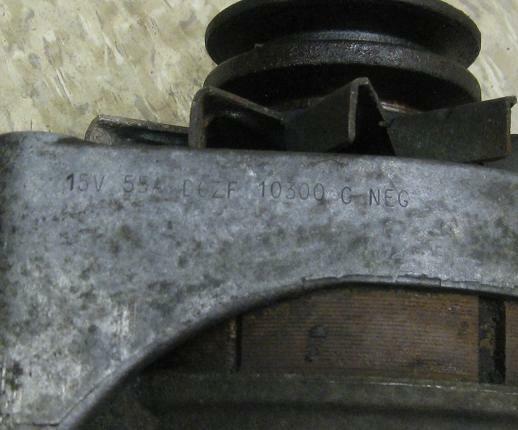 Bob Perkins and others have documented several cars equipped with the C8AF-A regulator and 55A alternators, so existing documentation appears to be inconsistent with factory assembly practices. The C8TF-A regulator apparently came into more common use as a replacement part serviced using part number C3SZ-10316-B (Motorcraft part number GR-341). See that "0F29C" ink stamp? That's a date code. See the AMK web site for a description of Ford's regulator date code practices. AMK also sells reproduction regulator covers that can be swapped onto a modern solid-state regulator, such as the Motorcraft GR540B or Standard Motor Products VR166X. Once the cover has been swapped it's impossible to see the internal differences. There are, however, two fairly consistent ways to identify a modern regulator with a swapped cover: the shape of the metal base is slightly different and modern regulators typically include a plastic terminal cover that isn't present on the originals. The differences are shown in the pictures below. Thanks to Pat Whalen for the pictures of the C8TF-A regulator used on this page.